In a way, Thanksgiving is a wine lover’s nightmare. With a laundry list of dishes packed with contrasting flavors and textures (some unctuous and sweet, others savory, crisp, vegetal or earthy), the Thanksgiving table could easily demand up to ten different wines. There’s an ongoing debate amongst the wine elite as to whether bubbly, whites or reds make the best match for Thanksgiving fare, and within these categories there’s an infinite number of contenders—off-dry German riesling or mineral Chablis for the whites, patriotic American zinfandel or spicy northern Rhône syrah for the reds. Now who has the energy to sift through all of that when you’re trying to avoid poisoning your guests with an undercooked turkey, struggling to figure out how to cram eight side dishes into a single oven, all the while turning your kitchen into a disaster zone in search of your grandma’s antique gravy boat? When it comes to finding the perfect wine pairings for your illustrious feast, forget about the turkey for a minute and focus on the preparations, the sides and the sauces. These elements harbor the bold-flavored spices, herbs and garnishes that will help dictate which wines you should reach for. While the turkey is Thanksgiving’s pièce de résistance, it’s a neutral canvas that derives its flavor from everything around it, including its marinade, the gravy and all of the traditional or not-so-traditional accompaniments (depending on your ethnic background). Check out these quick tips to create wine pairings that will elevate the bird, and more importantly, everything else that makes Thanksgiving so enticing. Aromatic spices such as cinnamon, allspice, nutmeg and cardamom add a pungent boost to many Thanksgiving recipes for yams, sweet potatoes and butternut, acorn or kabocha squash. To make these heady dishes shine, choose a red wine that has lots of spice character such as a carmenere from the region of Colchagua in Chile, a peppery syrah from the northern Rhone in France (try one from St. Joseph, Crozes-Hermitage or Cornas) or a Spanish garnacha blend from the regions of Priorat or Montsant. Fresh and fragrant herbs such as sage, rosemary, thyme and parsley often play a starring role in stuffings, wild rice dishes and gravies as well as compound butters, marinades or rubs for the turkey. To bring out the herbal notes in these items, choose a white or red wine that has pronounced herbal undertones such as a grassy sauvignon blanc from the Loire Valley in France (try one from Sancerre or Pouilly Fume), an herbaceous cabernet franc from Chinon or Saumur Champigny, also in the Loire, or a minty pinot noir from the Willamette Valley in Oregon. 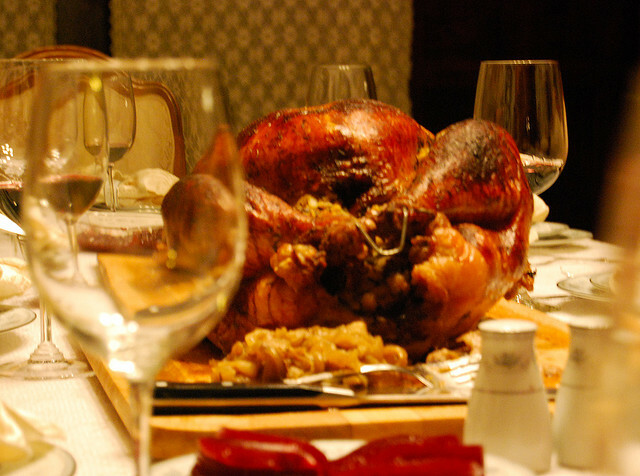 Thanksgiving food is notorious for its use of honey, molasses and brown sugar. When faced with foods that are sweet, such as cranberry sauce, sweet potato pie, candied yams and cornbread stuffing, you want to make sure to choose a wine that has enough ripe fruit or else the wine will come off as tart, sour or even bitter. If your Thanksgiving recipes tend to fall into the sweeter camp, opt for a wine with plenty of ripe fruit and a touch of sweetness (residual sugar) such as an off-dry German riesling, a floral gewurztraminer from Alsace in France, a Sonoma zinfandel or a fruit-forward malbec from Mendoza in Argentina. Green beans aside, most of what adorns the Thanksgiving table is quite rich in nature. Dishes made with a hefty amount of butter and fat interact wonderfully with sparkling wines such as champagne, cava or prosecco, whose bubbles and high acidity help to cut through the richness of heavy foods and refresh the palate. This is key when enduring a marathon feast. If you’re rolling high class, try a small-production grower champagne as opposed to a more commercially produced champagne, and if you’re doing bubbles on a budget, try a prosecco made in the regions of Conegliano or Valdobbiadene in Italy’s Veneto.